Water blasters don’t get much more rugged than this…Mounted in an industrial roll frame to protect your asset from accidental damage this unit comes with a lifting point so it can be hoisted easily in and out of vehicles. The industrial GX Honda motor is coupled to a low speed Italian Hawk pump to provide consistent high pressure and flow so you can get your cleaning work done quicker. 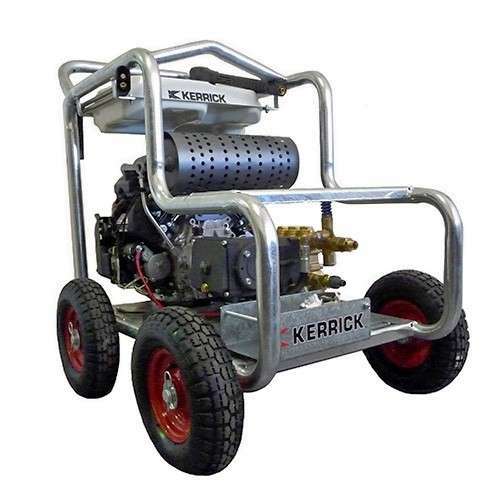 Choose from an impressive range of outputs including the HH3030 (3000 psi @ 30 L/min), the (HH4021 4000psi @ 21 l/min), and the HH5020 (5000 psi @ 20 L/min) these machines are ideal for industrial wash down and maintenance work. With the robust, high quality nature of this unit means you can rest assured they won’t let you down! Kerrick can customize flow, pressure and layout/mounts to suit your needs. Electric start Honda ‘V’ Twin 20 HP GX Industrial Engine (includes battery). New robust galvanised 4 wheel frame, allowing easy manoeuvrability. Thermal dump valve, heavy duty by-pass valve, pressure gauge, filtration and all fittings.